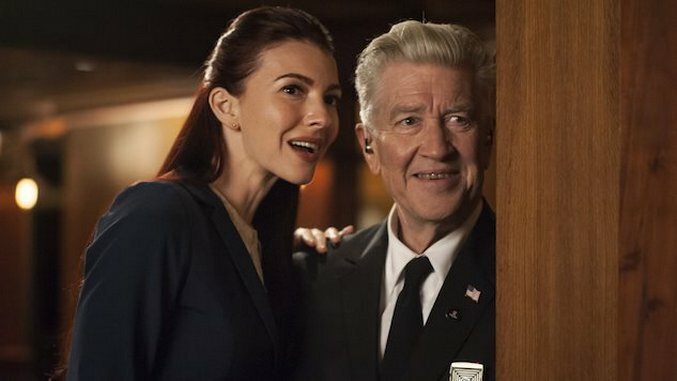 Chrysta Bell on David Lynch's Process and the Music of Twin Peaks: "The soundtrack of my lifetime"
Chrysta Bell’s speaking voice is uncannily like a harpsichord made of solid, hammer-warmed honey. There is ample melody in it, even when she’s not making music. Originally from San Antonio, Chrysta Bell (C.B.) is a singer-songwriter whose field of play is usually referred to as “dream pop,” but like a lot of genre-welding, that term’s not quite right. It’s a label, a term we used for a sound-and-feeling which hangs somewhere between the frolic of air and the business of fire. The spring of 1998 saw the singer making a major appearance on the television show Austin City Limits with her then-band, 8 1/2 Souvenirs. She released two albums with them. Her solo issue This Train appeared in the fall of 2011. C.B. is most famous for her partnership with the artist-for-all-seasons David Lynch, with whom she’s been collaborating sonically since 1999. She had a rush of additional fame after starring as Tammy Preston, the new FBI agent in this summer’s Twin Peaks: The Return. I met C.B. through a mutual friend. The time seemed right for an interview. The singer has a new album (We Dissolve, with John Parish), a tour coming up in November, and had an engagement the evening we spoke, but still found time to recollect by phone. During our conversation, she unspooled her adventures filming the series. Other writers have touched on the character of Tammy, the quality of the relaunch, and C.B.’s performance. As a fan of Dale Cooper and all he illuminates, this reporter’s bias was obvious, indisputable. My interest from the beginning of the interview was C.B.’s artistic experience, and the stop-and-go process of Lynch’s design and vision. We have reams of speculation on what Lynch might mean, less on how he does what he does. There are at least ninety-dozen ways to describe the Eagle Scout from Missoula. Given his history with secret woods, I prefer to think of him as a mammoth pine tree, indifferent to axes, sheltering and giving freely, nourished by a hundred streams. There is something undying in the man. And the people around him. I asked C.B. about the process of being brought into the world of Twin Peaks. “I’ve been thinking about this,” she said. “David and I make music together, and we were in the final session of Somewhere In The Nowhere, which is the EP that we released in 2016, and we have this kind of ritual where I come to Los Angeles, and he will make space in the recording studio, create time. Then we spend whatever time he’s available, and that involves hanging out and talking about life and other dimensions, and we have conversations about our beliefs, and then we make music. “So, he plays a track for me and I listen to it—and if we both love it, and if sounds to me like it’s a great song for great CD… then he’ll either write lyrics on the spot, or he’ll go down to the Black Box. And you’ll get some writing for the CD that he’s done in the past. We decide what we feel like will work with this kind of music, and then we just kind of sit together. And the whole thing takes shape and starts to have this life. And then, in between, if I’ve been in there for a while singing and my team needs to do some blending, David and I will take a break and we’ll go outside and smoke a cigarette, drink a coffee.” That was standard for them, she said. As in: ”’Okay, I’d like a lick of this, maybe I should do this, maybe I should call this person, maybe I should ask this person to be a part of this project.’ And I feel like David has that muscle and that lets you feel things that instincts might not. C.B. emphasized this point: “David’s not a kind of person who will say that something is happening and then retract it. He knows how big of a deal it is to someone… and still, he just doesn’t say things unless he’s really given it a lot of thought. And even still, I could tell he was like ‘Okay, I think Chrysta Bell is right for this,’ like he was still letting his confidence crystalize, like he was making the right choice… But then, when he said it to me, I knew it was a part of the project, like he said it out loud. I don’t know if he told anyone else about it, I don’t know if he discussed it, I don’t know … but he was like ‘I think there’s a role for you’ and I said ‘Okay’ and in that moment, it was so unexpected that I didn’t even know. She’d been twelve. The plot, characters, dialogue and storylines were not always understandable. The soundtrack, however, was a different ballgame. “I was totally into the music,” she said. “Music has always been the expression that resounded the most deeply to me, and the expression that I’ve chosen to deal with life personally. And the music in Twin Peaks—in particular the theme song, and the way that it’s blended with the visuals and the energy that it conveys—there was something about it… I was taken to a new place in my little being. I carried that to this day. Regarding her role, she said, “David knew I had confusion. He didn’t care that I hadn’t seen it in twenty-five years. David doesn’t get sensitive about that kind of thing, which I love about him. He doesn’t think [that], like, I’m more worthy because I was a Twin Peaks fanatic. It sounds a bit like falling in love, I said. You don’t know where it begins. I thought of those later episodes, “Part XV” particularly: with Nadine and “Ed you are free,” good old Ed Hurley and Norma; and Otis Redding’s telling us he’d “Been Loving You Too Long,” and the look of recognition in Agent Cooper’s eyes as the world finally broke through. And I thought of the slow gentle warmth in my chest as the lights of the Log Lady and the Log Lady’s cabin went out at last, not all at once but bit by bit, and isn’t it funny how each and every part of the world, even a make-believe one, is connected by invisible strings to some human heart out in the wide dark possible, and when they hit us just right the moving pictures on a screen are a mirror of all the words you’ve never said but felt, and in a very fast life a slow town in the deep woods can be as real as sky, it can be there for you whenever you want it, it’s there right now, even after 25 years, because nothing is lost, but just changes form—I can’t really talk about those episodes, about my emotions, I said: It’s like trying to eat a watermelon in one bite.